Rapini, commonly marketed in the United States as broccoli raab or broccoli rabe /rɑːb/, is a green cruciferous vegetable. The edible parts are the leaves, buds, and stems. The buds somewhat resemble broccoli, but do not form a large head. 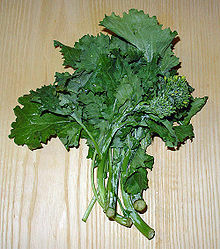 Rapini is known for its slightly bitter taste, and is particularly associated with Italian (as 'cime di rapa' or 'friarielli'), Galician, and Portuguese (as 'grelos') cuisines. Within the Italian tradition, the plant is associated especially with southern Italian cuisines such as those of Naples, Campania, and Apulia. The plant is a member of the tribe Brassiceae of the Brassicaceae (mustard family). Rapini is classified scientifically as Brassica rapa subspecies rapa, in the same subspecies as the turnip, but has also been treated as Brassica rapa ruvo, Brassica rapa rapifera, Brassica ruvo, and Brassica campestris ruvo. The young leaves of these plants as used in cooking are either the same as or the South European equivalent of turnip tops or turnip greens. Rapini has many spiked leaves that surround clusters of green buds that resemble small heads of broccoli. Small, edible yellow flowers may be blooming among the buds. The flavor of rapini has been described as nutty, bitter, and pungent. The flavour is also reminiscent of mustard greens. Rapini is a source of vitamins A, C, and K, as well as potassium, calcium, and iron. The cultivated vegetable probably descends from a wild herb related to the turnip that grew either in China or the Mediterranean region. Rapini is now grown throughout the world, and is available all year long with a peak season of fall to spring. Rapini needs little more than a trim at the base. The entire stalk is edible, although it may become more fibrous depending on the season. In Europe, rapini is widely used in southern Italian cuisine (in particular Basilicata, Apulia, Campania, and Sicily), in Roman cuisine, in northern Portuguese cuisine and in that of Galicia. In southern Lazio, Frosinone, Ciociaria, it is usually sauteed with garlic and chili pepper, and served with sausages and fresh baked bread so as to make a sandwich. In the Central Italy regions, rapini sautéed with garlic, chili pepper and guanciale can be a side dish for porchetta, grilled pork ribs, sausages and other pork dishes. In Apulia, its most famous use is in "orecchiette". One common method of preparation includes boiling the rapini in boiling saltwater before sautéeing in olive oil with garlic and chili pepper. Blanching is a common first step for preparation, after which rapini may be cooked in various ways, including sautéing, grilling, or roasting. In the United States, rapini is popular in Italian-American kitchens, particularly in southern New England, where it is a common filling for submarine sandwiches and a component of pasta dishes, especially when accompanied by Italian sausage. ^ "Brassica rapa subsp. rapa". Germplasm Resources Information Network (GRIN). Agricultural Research Service (ARS), United States Department of Agriculture (USDA). Retrieved 12 December 2017. ^ Resources, University of California Agriculture and Natural. "Rapini/Broccoli Raab". sonomamg.ucanr.edu. Retrieved 2018-06-17. ^ Elizabeth., Schneider, (2001). Vegetables from amaranth to zucchini : the essential reference : 500 recipes and 275 photographs (1st ed.). New York: Morrow. ISBN 978-0688152604. OCLC 46394048. ^ "Broccoli Rabe Pasta with Italian Sausage and Fennel | Familystyle Food". Familystyle Food. 2017-10-29. Retrieved 2018-09-10. Wang X, Wang H, Wang J, et al. (October 2011). "The genome of the mesopolyploid crop species Brassica rapa". Nature Genetics. 43 (10): 1035–9. doi:10.1038/ng.919. PMID 21873998. Osborn TC, Kole C, Parkin IA, et al. (July 1997). "Comparison of flowering time genes in Brassica rapa, B. napus and Arabidopsis thaliana". Genetics. 146 (3): 1123–9. PMC 1208040. PMID 9215913. Suwabe K, Iketani H, Nunome T, Kage T, Hirai M (May 2002). "Isolation and characterization of microsatellites in Brassica rapa L". TAG. Theoretical and Applied Genetics. Theoretische und Angewandte Genetik. 104 (6–7): 1092–1098. doi:10.1007/s00122-002-0875-7. PMID 12582617. Cefola M, Amodio ML, Cornacchia R, Rinaldi R, Vanadia S, Colelli G (April 2010). "Effect of atmosphere composition on the quality of ready-to-use broccoli raab (Brassica rapa L.)". Journal of the Science of Food and Agriculture. 90 (5): 789–97. doi:10.1002/jsfa.3885. PMID 20355114. Mun JH, Yu HJ, Shin JY, Oh M, Hwang HJ, Chung H (October 2012). "Auxin response factor gene family in Brassica rapa: genomic organization, divergence, expression, and evolution". Molecular Genetics and Genomics. 287 (10): 765–84. doi:10.1007/s00438-012-0718-4. PMC 3459075. PMID 22915303.